You've probably been to one of our emergency management and homeland security events in the past and believe it to be put on by the Pacific NorthWest Economic Region (PNWER). This is true, but in actuality, the work is part of the Center for Regional Disaster Resilience (CRDR) which is a sub-element of PNWER. 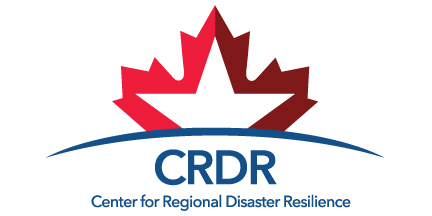 In order to better highlight the work of the CRDR, we adopted a new and separate logo in January of 2014. The logo above reflects the dual-nation status of PNWER (the maple leaf for Canada, the star for the U.S.); and the cross-border emphasis that makes PNWER such a unique organization here in North America. Admittedly, the majority of work done by the CRDR has been on the U.S. side of the border, but we hope to promote more cross-border emergency management and homeland security activities, like the Northwest Maritime Resumption Planning we recently facilitated. You will be seeing more of the logo in the months to come, and we look forward to working with you no matter which side of the border you are on.